Never miss a great Coldwater Creek coupon and get our best coupons every week! Treat yourself to your favorite styles with this great savings from Coldwater Creek! Sign up for the newsletter and get a coupon code to take 20% off orders of $75 or more, plus free shipping! See site for details. 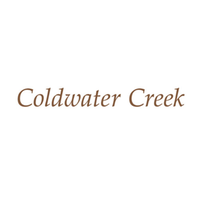 Coldwater Creek saves you money with these sales, just follow this link to the website to browse their current offerings. And while you're there, sign up for emails to get alerts about discounts and more, right in your inbox. Thanks for checking Groupon Coupons first! Get Coldwater Creek's best of autumn looks at their Fall Sale! 75% off incredible fashion with no coupon or promo code needed! Stock up on some plaid patterns, tunics, or breezy linen tops!! Click here to see all the latest blouses on sale!! Sure, Wednesday gets all the press as humpday, but we kind of think Thursdays are worse. It feels like it's almost the weekend, but you still have Friday to get through. That's why we love deals like this! Every single Thursday, Coldwater Creek makes us smile with brand new markdowns. It's Thursday Splurge-Day! Groupon customers rejoice! We've cooked up a deal so jaw-dropping, so flabbergasting, so mind blowing, that Coldwater Creek won't even let us tell you what it is. But trust us: it's a doozy! Insider Tip: Coldwater Creek updates its new markdowns every weekend, meaning you can get the latest sales just by shopping through this link. Visit Coldwater Creek today and shop the latest markdowns to save big! See site for details. Come to Coldwater Creek now and grab awesome deals on outlet items! Visit Coldwater Creek now and open up a Coldwater Creek Credit Card to get 20% off your first order with the card! See site for details. Shop til’ you drop with this Coldwater Creek sale! Save $20 off dresses when you shop now! Coldwater Creek has more for you this spring. Right now, save on Misses! Order today! Shop Coldwater Creek and check out the great selection of sales and clearance! Makeover your wardrobe today! Shop Coldwater Creek now for a river of savings! Save On Clearence! Award winning deals are yours when you shop Coldwater Creek! Click through now to check out the latest markdowns! Deals, discounts, and more deals! You’re covered at Coldwater Creek. Today get Petite Style Clothing and Save. This coupon expired on 04/22/2019 CDT. This coupon expired on 04/21/2019 CDT. This coupon expired on 04/11/2019 CDT. This coupon expired on 04/06/2019 CDT. This coupon expired on 04/01/2019 CDT. There’s no reason to brave the cold! Stay warm and cozy by shopping online at Coldwater Creek. While you’re there check out their Save on Love February Sale. This coupon expired on 03/14/2019 CDT. Take advantage of this awesome offer! Get $10 off of best-sellers today at Coldwater Creek. This coupon expired on 03/11/2019 CDT. Since Dennis and Ann Pence founded Coldwater Creek in 1984, the company has taken the nation by storm. Thanks to its catalogs and online shop, the brand's distinctively sophisticated styles still reach fashion savvy shoppers even if there isn’t a location in their area. But that's only half the story. The other half? Unlike other brands that traffic in unrealistic body image or play on insecurities, Coldwater Creek designs clothes for real women with flattering apparel in women's plus and petite sizes. That deep commitment to respecting their customers has helped the outfitter flower from one storefront to more than 300 shops staffed by 10,000 employees. Oprah even honored the clothing brand in her magazine's annual "Best of the Best" feature. Coldwater Creek’s clothing features classic shapes. Whether investigating the maxi and sheath skirts or sifting through shift dresses and warm pullovers, you can be sure to find a vintage-inspired vibe that combines color and form. Coldwater Creek’s designers are careful to select styles that harken back to fashion mainstays but add a modern touch, perhaps with bright floral or bold geometric designs. This emphasis on tastefulness and timelessness is what makes shopping at Coldwater Creek fun. And with a Coldwater Creek coupon from Groupon, you can routinely find the perfect look for upwards of 25% off. How Can You Save Money At Coldwater Creek? It couldn't be easier, and there are a lot of ways to do it. First, you can sign up for emails from Coldwater Creek, and they'll automatically send you a code for 20% off your first order. From there, you'll get exclusive discount codes along with first dibs on Flash Sales and new markdowns. You can also browse our constantly updated selection of Coldwater Creek promo codes right here at Groupon Coupons to find special savings and discounts on new fashions, the hottest accessories, and more. If you're entering a promo code on the Coldwater Creek website, you'll add it right from your shopping cart. That way, you'll know before you're ready to check out exactly how much you're saving. Just click "APPLY"
If you sign up for emails from Coldwater Creek, you’ll be notified immediately about sales, discounts, and special offers.